All 24 Circuit Court judges were asked if they thought the case should be reheard, but only 9 thought they should. So it’ll either go to the US Supreme Court or the 9th Circuit, most of the west coast, will be removing “under god” from their pledge time. I remember wondering why the heck “under god” was in the pledge when I was saying it in 5th grade. It never felt right. I even recall muttering those two words under my breath in high school home-room in an attempt to lessen it’s hold on me. And I went to a catholic high school. I’m glad they’re putting that phrase down. 1. About 15% of adult Americans are insulted by the phrase “under God”, either because they are non-religious or practice a religion that does not believe to be under one god. For 15% of adult Americans, the phrase “under God” is a direct affront to their religious sensibilities. 2. The phrase was added to the Pledge in 1954, in defiance of the “godless” communist threat. Well, the Cold War is over. In the current political and terrorist climate, one could easily argue that “God” is causing more problems for the U.S. government than he is solving. Just to be clear: all of the above only applies to those areas under the jurisdiction of the 9th circuit court, not the rest of the country. 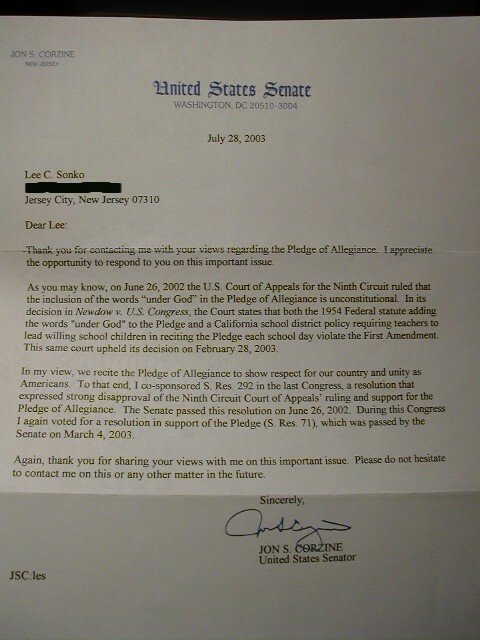 My 5th grade experience was in New Jersey… under the jurisdiction of the 3rd Circuit Court. RE #1: My statistic of 15% of Americans being offended is a national statistic. Read. RE #2: That was a national issue, not local. I believe every US citizen of course should voice his or her opinion but you should keep in mind this country was established based on religion…. on God…. Would you say that making a law mandating that all students in congress-provided schools makes a law respecting the establishment of religion? Would you hazard a guess that a person that does not believe in “God” would feel as though their free exercise of religion was being infringed upon if they were forced to recite a phrase each day that professed a belief in “God”? For you to say that 15% of Americans are offended by “under God”, one would have to assume that every single unbelieving American is offended. If the poster “40 million Americans are good without God” is true, that would represent 13% of the estimated 307 million Americans total (wikipedia). Therefore ALL 13% of non believing americans and 2% of believing Americans would have to be offended by this phrase for this fact to be true. That’s a pretty high confidence level by anyone’s standard. If there were a small portion of athiest that didn’t care, then the only way for this statistic to be true is that there are ALOT of Americans athiests that ARE NOT GOOD with God–and they’re offended too. :) Just playing with numbers, don’t mind me. Anyhow, to point: it’s hard to dispute that this country was founded on the principles and premise of a supreme being. The declaration of independance says as much plainly. I doubt anyone would get very far with modifying it to say “We hold these truths to be self-evident, that all men are created equal, that they are endowed by 1 billion years of statistically improbable freak chance with certain unalienable rights, that among these are life, liberty and the pursuit of happiness. Whether you like it or not, whether you believe it or not, a nation under God provides a framework of truths that allow for laws and structure that enables the society to function. Without a God, would right and wrong exist? If so, who would define right and wrong if 6 billion + couldn’t agree with it? I presume a majority would rule? The elite? The educated? Who defines who is educated or qualified to decide? If majority decided right from wrong, shouldn’t majority rule in this case too? 85% to 15% aren’t offended. The 15% could simply opt out of saying “under God”. I mean really… is it that offensive? Are you that phobic of God that you’re offended by THE REST OF EVERYONE asserting what they believe to be true? That the REST OF EVERYONE is asserting as much what this country was founded upon? I’m sure there’s a minority of people that don’t believe they should pledge thier allegience to any ONE nation, regardless of where they live. If they found that notion offensive should we just delete the whole thing? There wouldn’t be much left to pledge to if we got rid of everything that at least a few people were offended with. Seperation of Church and State is one thing. But it’s taken WAY too far. Taking God out of laws, schools, off of money and out of everything Government is dangerous. It leaves everything to subjectivism. To the truth that is “in yourself”. If that’s different for everyone, then it WILL lead to chaos. Unless you believe that mankind is inherently good–in which case I wonder why in the heck the news is always so bleak. That’s all I get? I thought you were into debating. You haven’t even told me which parts were mathmatically challenged. You just dismiss it? Ha. If you can’t even say which is mathmatically challenged… is it fair to say that the 40 million Americans number is mathmatically challenged as well? I can understand why people ask why God “lets bad things happen to good people”, but can’t understand why people don’t question why “inherently good people” consistenly do such crap stuff. Well, if there is something that I am familiar with, it’s significant figures. 40 million Americans — United Coalition of Reason’s number. 40/307 is 13.029%. Rounded to two significant figures, you’d get 13%–not 15%. So which fact is wrong? One would have to assume that 2% of believing Americans would be offended by the very thing they believe in. Or the 40 million thing is wrong? I suppose it’s grossly understated. But in my experience when someone wants to make a point, they try to either nail it or overstate. You are quibbling over 2% instead of the important issues. You have a problem with significant figures, hence “mathmatically challenged”. Ha! I’d love to see you drive in a car that was built by someone who didn’t quibble about significant figures. You have just implied that all engineers, scientists and mathmaticians (the ones who “have problems with significant figures”) are all mathmatically challenged. Seems like your logic is somewhat…erm…counter-intuative? …illogical? …erroneous? 2% difference is only 6.15 MILLION people off. That represents the total number of people in ARIZONA–the 16th largest state by population. Sorry to be so mathmatically challenged to be so caught up in significant figures. We really shouldn’t be too bothered by them when we’re trying to make a point. You’re still quibbling instead of discussing the important issues. I’ve discussed the important issue. You didn’t respond to any of it except for the alleged bad math. Ok, back to the important issue. Using 2001 Census, 212M Americans were over 18. So, your 15% (or 32M) of people that are offended by saying Under God, you’d have to include ALL nonreligious/secular (27.5M), ALL atheist (0.9M), all Agnostic (1M), and all humanists (0.005M) and an additional 2.4M of the deists or polytheists to reach your 15%. Plus assuming everyone claims to be nonreligious/secular are all offended is a BIG assumption. The numbers lead me to believe that only a fraction of number would care enough to be offended. Further I’d deduce that only Atheists would truly be offended because they’re the only ones that made “not believing there is a God” their religion. Perhaps Agnosts may also be put off a bit, but they’re just not positive God doesn’t exist so they may waffle on being offended too. Athiests only represent less than one half of one percent (0.4%) of adult Americans. I guess I would just suggest that all people offended just not say “under God” when reciting the pledge. The numbers lead me to believe that only a fraction would care enough to be offended. Further I’d deduce that only Atheists would truly be offended because they’re the only ones that made “not believing there is a God” their religion. Perhaps Agnosts may also be put off a bit, but they’re just not positive God doesn’t exist so they may waffle on being offended too. Athiests only represent less than one half of one percent (0.4%) of adult Americans. The difference between 15% and 0.4% is pretty big. I’d guess it’s somewhere inbetween, but closer to the lower. I guess I would just suggest that all people offended just not say “under God” when reciting the pledge. It’s just way to difficult to cater to everyone’s wants. Saying under God means something to most Americans still, and it does give it a greater sense of meaning and purpose. If at least it is mildly inspirational to be a part of something bigger than yourself, and bigger than just this nation. Ken, you’re making a great argument against yourself. Would you suppose that a nonreligious person would want to pledge that their nation is under the control of an omnipotent religious being? The question answers itself and it is “no”. Your second paragraph starting “The numbers…” displays a gross lack of appreciation for other peoples’ personal religious views. Do you know any people that would call themselves non-religious? >Would you suppose that a nonreligious person would want to pledge that their nation is under the control of an omnipotent religious being? The question answers itself and it is “no”. Lee, I would suggest I guess that of the 27.5M people that don’t care enough to classify themselves as none of the following categories (which include everything under the sun, all the way down to Atheist and humanist), don’t care enough about it to go as far as saying “I’m offended”. Because if you’re not one of these, and your not an Atheist…I’m really not sure the the “not otherwise specified” category includes. Besides, they’re not pledging allegiance to an omnipotent religious being. It’s an acknowledgement that THIS nation (whether they like it or not), is ruled and regulated under the premise of a being or thing bigger than it. Further, given the census data you provided there’s nowhere close to 40 million Agnostic, Non religious and Atheists. As of 2001, there were 30M. I would seriously like to see where/how 40 million people agree that they’re fine without God. Isn’t that presumptuous of you? Have you ever met nonreligious people that weren’t okay with believing that there wasn’t a God? I have plenty. They wanted to believe something, but crap held them back from it. Did 40M people sign their names to a declaration? I also wonder given the same presumed number of Americans that would change their tune when faced with near death experiences. We like to live our lives as if God doesn’t exist, but when it comes to the business of dying people aren’t so fervent in denying God. >Do you know any people that would call themselves non-religious? Are you kidding me with that question? Haha… Although I’m not sure to defend myself here, I suppose I could say I’ve been around. It’s like me asking you if you know anyone outside your a-religious circle of influence. Now I see more clearly why there have been recent advertising campaigns to promote secularism, to move the 27.5 million “swing votes”. * THERE’S PROBABLY NO GOD NOW STOP WORRYING AND ENJOY YOUR LIFE – on the side of the UK bus in June 2008. >regulated under the premise of a being or thing bigger than it. >>question answers itself and it is “no”. Ken, you’re going to have to restate that. I can’t figure out what you mean. To paraphrase, I said the Pledge says, “the nation is under the control of God” and you reply, “No, it’s ruled and regulated by God.” I’m not catching the difference. >question answers itself and it is “no”. Sorry Lee. It is my turn to confess I misread your intent. When I originally read through it, I read it as atheists offended that they themselves would be pledging to be “under God” not allegiance to a “nation under God”. All this time I assumed the arguement was they they didn’t want to pledge to be under God’s thumb. In this case, a personal omission or the words “under God” would have sufficed. Now I see that Atheists are more offended at the notion that this nation proclaimes to be under God. To that, I don’t really have much to say. Founded on the premise of a God, restated in the pledge as such when added during the cold war in light of the “godless” soviet republic, I’d gather the atheistic movement would sooner just have the nation forget it’s roots and what principles it was founded upon. First by eliminating the ten commandments from any legislative body, swearing any oath to humankind rather than a God, then by tackling the pledge, and then off to every governmental plaque, war memorial or otherwise stating as such. After that? Money burning/smelting. They all say in God we trust. I figure, if any arguement makes gains for pledge removal (as offensive), then by the same merit everything mentioned above should be taken care of too. And if atheist get their way, it will happen…eventually. In light of that, I’m not sure why Atheists are opposed a nation that believes in God. Even if there isn’t a God, the ideology of such provides a basis for all kinds of great things like equality, justice, “hard unchangeable truths” which provide boundaries for all people to live by to keep some sembleance of order. BTW, I have to admit… I appreciated your candor in calling the 27.5M people “swing votes” :) It made me laugh, all the while putting things into perspective. In light of the current US politics, I was imagining grand political campaigns for pro God and pro Nogod. I wonder what the pro nogod campaign animal be? It would have to be one on the top of the foodchain–most evolved animal specimen yet. :) A lion perhaps? The unbeatable flu strain? What would your suggestion be? I was thinking a Human, but that wouldn’t be any fun–too obvious, and we still like to think that we’re not animals.